A pretty miniature vase / ewer / pitcher. Measures 3" tall and is in perfect condition. Has the original foil Chadwick sticker on the bottom. 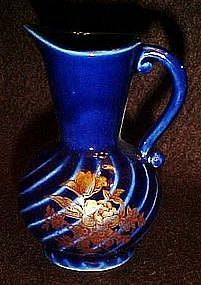 Pretty cobalt blue glaze with gold to bronze floral decoration. A great addition to your miniatures or pitcher collection.